If you were to try to determine which guns truly influenced the history of the world, you could draw a few conclusions. 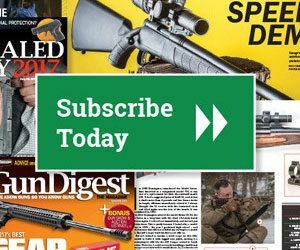 Paging through The Greatest Guns of Gun Digest edited by Dan Shideler, you see the Colt Single Action and the Winchester 94, both guns that won the West and aided exploration into the last frontier. The Luger is included and that pistol played a role in WWII. The 1903 Springfield has a chapter dedicated to it and deservedly so as it was probably the greatest rifle in U.S military history. Many other guns are included in the book, and they are certainly great but how much did they influence the course of history? What was one gun that was pivotal is changing the history of a society? An obscure air rifle can be credited to have an enormous influence on how the young country of the United States of America developed. It was a Girandoni, an Italian-made .46 caliber repeating rifle. How it arrived in America in 1803 is unknown but it became the essential weapon of Lewis and Clark on their westward explorations. Without the firepower of the Girandoni, Lewis and Clark may have never survived their journey. Watch this brilliant video produced by the NRA’s National Firearms Museum. It’s the about history of the gun and how Lewis and Clark capitalized on its features which in turn, made their journey a success. It is the most fascinating vintage air rifle you will ever come across. Had this one gun not fired its shot that day, our nation might well have started differently. I agree with SmithKoWitz. The musket was without a doubt what provided us with our United States. The air gun of Lewis & Clark was important but though they found the way West it would have happened in any eventuality. Maybe year into the future but it would have happened. The musket provided Lewis and Clark with the freedom to do that exploration. Had it not been for the musket they would have not had a country to do the exploration for. Smoothbore Flintlock Musket; without the winning of the Revolution for Independence, there would have been no USA to fight future battles like: The Civil War, WWI, WWII, Korean War, Vietnam and beyond. The U.S. Rifle, Caliber .30 M1 or more commonly known as the M1 Garand. No doubt. First: to the title of this article, Horse puckey. Second: to your comment, I’m in full agreement.